MONTREAL - His name is Orville and, against all odds, he's still alive. He's a dog who was shot in the head and left for dead, and he's pretty much recovered from his injuries since being found in a ditch in Quebec's Eastern Townships about two weeks ago. Quebec provincial police said Wednesday that they have opened an animal-cruelty investigation. Meanwhile, the head of an animal shelter where he's being housed said Orville's recovery has been nothing less than a miracle. Carl Girard said he and other staff couldn't bear to put the animal down, even though Orville was partly paralyzed and not eating after being found on Feb. 24. They thought he was brain dead when Orville first arrived at the shelter. Girard said the first two days of treatment provoked no response. But then, on the third day, he got better. "He started to walk a little and, after 10 days, he's almost back to normal," Girard said in a phone interview from Cowansville, Que., about an hour southeast of Montreal. 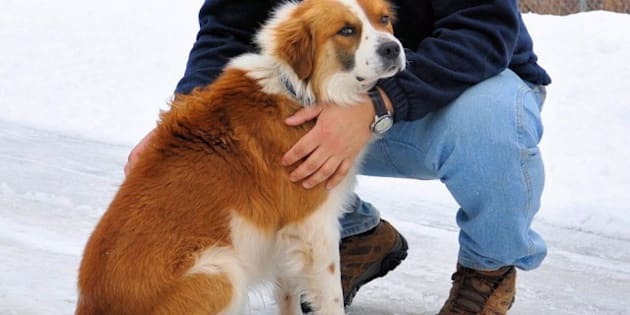 The two-year-old, floppy-eared, Australian shepherd was taken for dead when a passerby first spotted him on the side of a road in Brome Lake. Girard's best guess is that Orville came from a farm, because he doesn't exhibit signs of house training. He had a thick, long winter coat and was full of intestinal worms. He appears to have been shot behind the ear with a .22-calibre weapon. An X-ray shows the shattered bullet still lodged in the dog's skull. It might have been a botched attempt to euthanize the dog. "It (the bullet) kind of exploded in the brain so it would be difficult to take it out," Girard said. "He's going to have to live with it." Girard has filed a complaint with provincial police and says the online attention Orville has received might drum up some leads. He's also filed a complaint with the local municipal authority. But a police spokesman says the force has little to go on for now. "I can only tell you we have a complaint (in hand), but there's nothing new at this time," said Sgt. Daniel Thibaudeau. "But it's an open file." Two weeks since being found, Orville is up and about, although he has problems with one of his front legs and he loses balance when he runs. The two-year-old also shows clear signs of having been abused. He is fearful of sticks and brooms. He won't eat food out of a human hand, Girard said. Orville now spends most of his days in Girard's office, but his condition has greatly improved. "He runs, he plays, just like any other dog," Girard said. "To see how he is today is just wonderful." The shelter chooses a different letter each week while naming its new strays. In the last week of February, they were at the letter "O." In the end, they settled on Orville, stemming from Girard's appreciation for Orville Redenbacher pop corn. "We wanted to find a name that wasn't going to (label) him as a victim," Girard said, "so we chose Orville."